We're changing things up this Thirsty Thursday! Instead of a tasty cocktail to launch you into the (almost) weekend, we're blending up (no juicer necessary) an equally delicious, non-alcoholic juice. Now's the perfect time to detox, but don't worry, we're not going to suggest some crazy part-juice-part-nothing-else drink plan. We're changing things up this Thirsty Thursday! Instead of a tasty cocktail to launch you into the (almost) weekend, we're blending up (no juicer necessary) an equally delicious, non-alcoholic juice. Now's the perfect time to detox, but don't worry, we're not going to suggest some crazy part-juice-part-nothing-else drink plan. Summer is nearly over and it's a good time to give your body a break from the sugary sips, picnic foods, frosted cupcakes, and over-indulgent vacations (hey, it's vacation!) with this Antioxidant Supreme. Yes, it's a juice blend, but it's anything but boring. 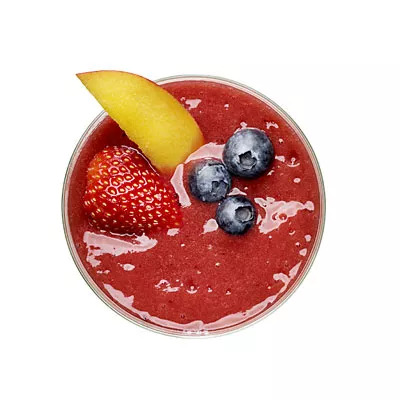 It contains a mix of blueberries, strawberries, mangos, and just a bit of water. Antioxidants (found in high levels in fruit) are thought to help battle wrinkles and aging skin, lower the risk of some cancers, fight heart disease and other ailments, and help immunity. What's more, blueberries may help lower blood pressure, strawberries have heart-protecting nutrients in each bite, and mango is a rich source of fiber and vitamins. Oh yes, and they taste great! Want to make this juicy drink into a smoothie instead? It's simple: Combine 1 cup of juice from the recipe, 1 cup ice cubes, 1/2 cup low-fat plain yogurt, and 1 medium peeled banana in a blender. Purée until smooth. Are Your Instincts Making You Fat?